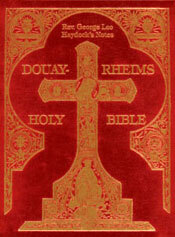 The Haydock Bible is a larger-print (12 point) format Douay-Rheims Catholic Bible with a comprehensive Catholic commentary (210 sources used!) and an illustrated Catholic Bible Dictionary and History of the Books of Holy Scripture reproduced from the 1859 edition of Fr. Haydock, whose superb explanations and commentary take up about one-half to two-thirds of each page. The commentary is drawn largely from the Fathers and Doctors of the Church - ABSOLUTELY INVALUABLE. The copious commentary (which is NOT large print) and accompanying dictionary make it the best English Bible available if you want to understand Holy Scripture. If you want a Bible that is not just the Word of God but will help you to understand the Word of God, then look no further! Old Testament with engravings and illustrations, Space for recording family births, marriages, and deaths, Tables (Biblical weights and measures, etc. ), Historical and Chronological Index, New Testament with illustrated Bible Dictionary, Historical and Chronological Index and History of the Books of the Catholic Bible. PERFECT FOR CONFIRMATION, WEDDING, CONVERT GIFTS, etc. Previous editions were in two softcover volumes. This edition is one hard cover volume on fine Bible paper with a gold-leaf image on the burgundy leather cover along with a satin ribbon marker. Size is 8 1/2 inches by 11 inches.